Comments: The seeds of love begin to sprout. I'm still only halfway through Yoshikawa Eiji's Musashi, so I've enjoyed being able to read this manga, based upon the classic work of Japanese historical fiction. However, the enjoyment stems from more than using Inoue Takehiko's incredible artwork and storytelling skills as a sort of Cliff's Notes for the novel. Rather, I've taken to treating these graphic novels as a work in their own right, as they most undeniably are. 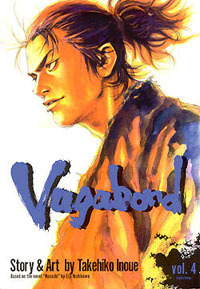 Of course, Vagabond is clearly based upon Musashi, but there are subtle changes and abridgements that are necessary not only to keep the average manga fan interested in the story but also to ensure that the entire tale can be told in less than twenty years. This is indeed a long and complex tale, following the life of the man known as Miyamoto Musashi, one of the most famous and well-respected swordsman-philosophers of the Japan of centuries past. This largely fictional account maintains credibility as it poses one possible path Musashi's life may have taken on his way to becoming the author of the Book of Five Rings, among other noteworthy works. In this version of his life, Musashi starts out as a violent youth eager to make a name for himself by satisfying his lust for blood. However, he is quickly subdued by Takuan Soho (with the aid of childhood friend and a potential lover, the beautiful Otsu), a practicing monk of Zen Buddhism. Chastised by the monk and ashamed at his own inadequacy as a rational human being, Takezo resolves to become a better man and buries himself in classic philosophical texts, emerging years later with a new name, as well as a new outlook on life. In the last volume, he set out to challenge himself by taking on the greatest martial artists in the land, leaving his past behind him. He left both Otsu and his hometown, taking on the name Miyamoto Musashi as his only reminder of the past (since he's from the village of Miyamoto). His most recent bout was with the Yoshioka school of sword fighting. Once, it was considered to be the greatest of all the techniques in the land, but a generation has passed since its founder established its greatness, and the school is widely rumored to have lost its fighting touch. However, that doesn't make it an easy target for the headstrong Musashi, and he barely escapes with his life after challenging the entire Yoshioka school to a fight. It's a testament to his strength and resilience that he was able to survive such a challenge, but Musashi doesn't leave any battle without learning something new - a trait his enemies would do well to remember. I was slightly disappointed with the last volume, as I wasn't sure that Inoue's alterations with Musashi's character were very appropriate (he was headstrong - not dumb), but this time around everything is back up to par with his previous work. The volume begins with a scene depicting Musashi dreaming of Otsu, suggesting that she may yet have a role to play in the life of this particular swordsman-saint. This time around, we're finally introduced to Jotaro, Musashi's first disciple, the young boy that saved Musashi's life after his fight with the Yoshioka dojo. The addition of this young boy tagging along as Musashi makes his journey won't be the last similarity to Rurouni Kenshin (think Yahiko), though Musashi was written first. The quality of artwork has in no way diminished as this series has progressed, which is amazing considering its incredible amount of detail. From clothing patterns to rice fields, Inoue's skill as an artist is obvious. Character designs remain realistic and as solid as before. It's nice to see a series that portrays characters as Japanese people rather than the typical manga standard (big eyes, small mouths, spiky hair). While there's definitely a penciled feel to the series, it's not nearly as sketchy as Blade of the Immortal (not that either style is bad, they're just different). Every scene feels complete and worthy of framing, if you wished to. I've raved about it before, and I have to comment once again - this is the way manga should be printed. As I suggested in my column not too long ago, this should be a standard-setting format. The book reads from right to left, the violence appears to be uncut, the MSRP is a relatively low $12.95 (compared to the far smaller Di Gi Charat, published last month by Viz), and there are color pages inserted every few chapters. The editors have thoughtfully included a couple of pages featuring background information connecting the historical facts to this version of the life of Musashi. The cover illustration is excellent, and even the logo is one of the better designs I've seen for a graphic novel. This book has every right to be Viz's flagship title. Both technically and content-wise, this is a top-notch title. Do us all a favor and support this series so that Viz might produce more of their releases in a similar way. I'd love to get my hands on some unflipped, less expensive, less censored Ceres, Ranma, or Video Girl Ai.